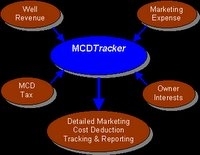 The MCD Tracker is a system designed to automate the process of filing for marketing cost deductions. This system eliminates the guesswork and estimation, provides a full audit trail of all results, can reproduce data as it existed at any point in history, improves cash flow, increases accuracy, and decreases the amount of man-time necessary to handle the filing of marketing costs and any subsequent state audits. What makes the MCD Tracker so unique is that it bridges multiple sources of data from both the expense and revenue sides of a company to archive pertinent data. Automatically imports all available data into the system for use, which eliminates the need for extrapolation based on small subsets of the data. Acquires data from 3rd party and in-house systems. Manual data entry screens are provided where automatic import cannot be accomplished. Manages flow of all costs and deductions through potentially thousands of relationships between cost centers, well completions, and tax leases. Computes Depreciation and ROI for all Tangible Materials (Equipment) and adds this to the marketing cost deductions. Takes into account all marketing arrangements and only considers gas that is marketed by the company. A separate schedule is generated for the remaining gas should other partners wish to know this information for their own filings. Appropriately handles gas-lift per state rules. Takes all tax history into account to consider severance tax already paid, and any marketing cost deductions already taken. Ensures that the minimum tax is paid based upon the tax lease type. Provides a complete audit trail of all calculations. 100% reproducibility of all historical results using a date-effective data model. Calculates credits due to all parties with a working interest in any wells involved. Provides exception reporting to prevent unallocated expenses and other lost credits. Electronically automate the actual tax filing process with the state.